The world’s largest surfboard fence was first created in 1990 in preparation for an approaching hurricane. 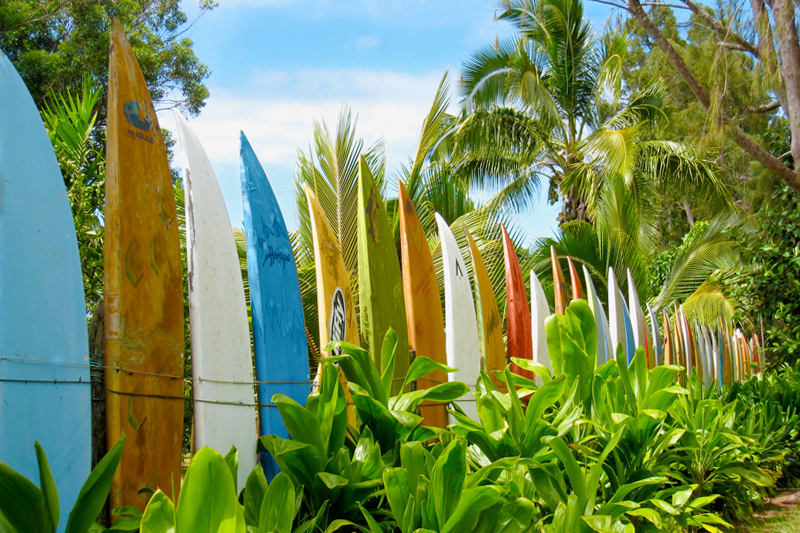 The functional fence of colorful recycled surfboards has been growing ever since. Rumors put the the number of boards at 500+. The owner of the artistic fence accepts donations of surfboards. This is a great diversion and photo opportunity while taking the Road to Hana. It’s best to simply take a photograph from your rental car. If you must park, there is a pullout near the intersection of Hwy 360 (Hana Highway) and Kaupakalua Rd. Please be courteous of the owners, neighbors, and other drivers using the roadway. View location and map to the surfboard fence. Unfortunately, there is not a guided tour for this tourist attraction. We rocommend that you include this photo opportunity if you ultimately decide to hire a car on Maui to experience the road to Hana, Maui. Driving on the island is relatively simple and the roads are well maintained. Note: This is the first and original fence. There is a similar fence made out of surfing boards on Hana Hwy (near Kuau). There is also a fence of boards on the south side of the street along the Hana Hwy at a business in Paia.